Continuing our theme of operating leverage and momentum, we examine Industrials in the US to look for value where estimates are rising. The eye catcher is CAT, which we will cover separately, but which has seen a major positive revision in a very short period – especially for a large cap stock. We can see both upside and downside risk to CAT depending on the underlying assumption set and it warrants further review. 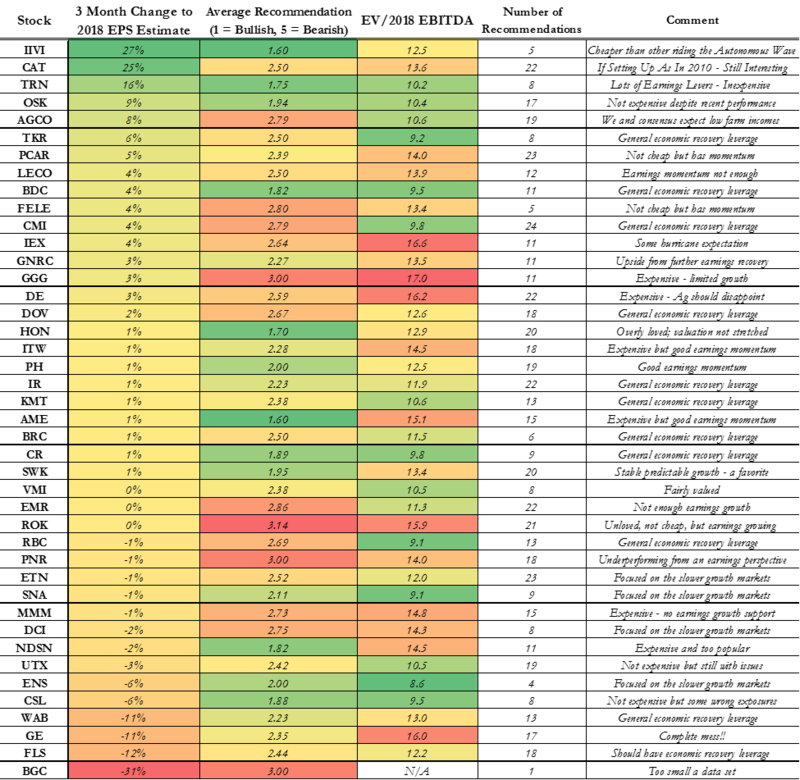 If the CAT estimates and momentum are appropriate – TRN, IIVI and GNRC look more interesting to us – see recent research. At the other end of the scale is GE – where revisions remain negative and the corporate body language is doing very little to inspire confidence. GE needs a radical strategy shift to restore confidence – see recent research. This may not be enough to offset the negative reaction to a significant 2017/2018 earnings reset, a potentially alarming reconciliation of recent cash flows and earnings and an (inevitable) cut to the dividend. Mr. Flannery must clean house completely to have credibility through year end. We remain concerned that the stock will need to go lower to find a stable floor. High values on Ag Equipment, despite a weak farm economy and no sign of recovery. Sell side dislike of Pentair – despite activist involvement – activists have generally led to higher values even when campaigns have been unsuccessful, particularly Trian. Expensive companies levered to the wrong industries (those not expected to grow well): DE, GGG, MMM, DCI. Expensive companies too popular with the analyst community: NDSN, AME (possibly) and HON (possibly). 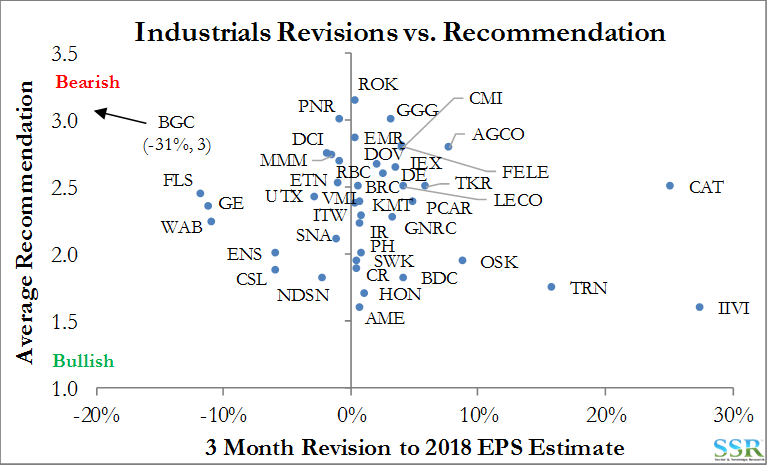 As with Chemicals, there is no real correlation between revisions and recommendations – we are not seeing increasing estimates making analysts more bullish and decreasing estimates where analysts are more bearish. To a degree this is a function of analysts sticking to their stories, but it is also reluctance to chase a stock where valuations are high, despite the earnings momentum. 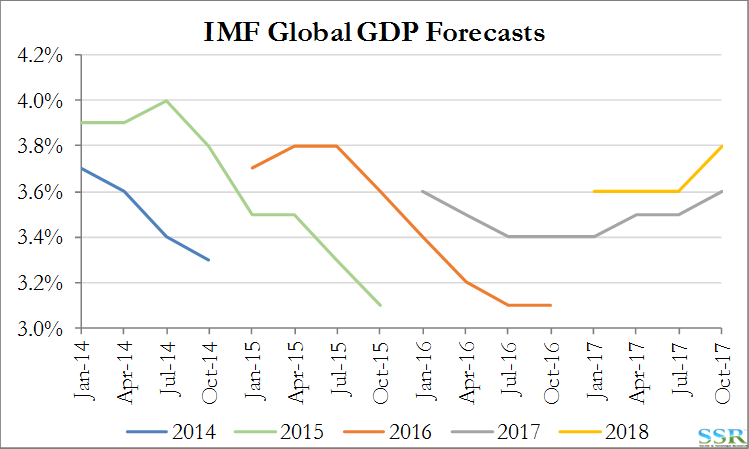 If you have missed a 50% move you feel that you are late to the story and do not want to risk upgrading a company at the top; however, if the earnings momentum is real – see Exhibit 3 for this week’s IMF GDP forecast revisions – you may miss the next 50%. 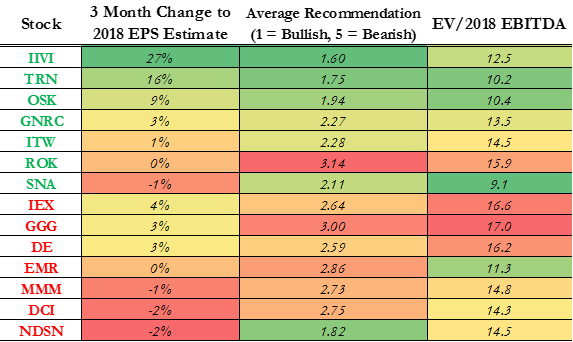 Exhibit 4 contains the data for all of the companies we chose to include in the analysis – we have added the number of analysts covering each stock, casting doubt on the relevance of some data where there are only one or two coverage analysts: BGC for example.